An MIT-altered robot backed with AI provided scheduling recommendations to labor ward nurses at Beth Israel Deaconess Medical Center. See how it turned out. MIT researchers were recently able to demonstrate that the could train an altered Nao robot to learn the ins and outs of room scheduling in a labor ward at Beth Israel Deaconess Medical Center in Boston. Nurses accepted the robot's recommendations 90% of the time. Just to make sure the nurses weren't blindly accepting the robot's advice, the team also had the robot provide consciously bad feedback--which was also rejected at a 90% rate. The system, then, knew how to distinguish between good and bad recommendations and learn accordingly. That's no small feat when one considers how labor ward nurses are trying to predict when a woman will arrive in labor, length of labor, and whether C-sections or other procedures will be required. "Like many AI systems, the team's robot was trained via 'learning from demonstration,' which involves observing humans' performances of tasks. But [MIT PhD student PhD student Matthew Gombolay] says researchers have never been able to apply this technique to scheduling, because of the complexity of coordinating multiple actions that can be very dependent on each other. To overcome this, the team trained its system to look at several actions that human schedulers make, and compare them to all the possible actions that are not made at each of those moments in time. From there, it developed a scheduling policy that can respond dynamically to new situations that it has not seen before." Don't miss the MD&M Minneapolis conference and expo, September 21-22, 2016. The researchers, led by MIT professor Julie Shah, presented their paper at the recent Robotics: Science and Systems (RSS) Conference. Gombolay, MIT postdocs Xi Jessie Yang and Brad Hayes, and Neel Shah and Toni Golen from Beth Israel Deaconess Medical Center co-wrote the paper. The work could be especially useful because scheduling is a skill that only a subset of workers seem able to master. It is hard to teach. 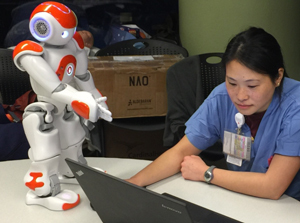 One nurse involved with the MIT study said the robot allowed "for a more even dispersion of workload." Another nurse thought the robot might help "new nurses [who] may not understand the constraints and complexities of the role." "A great potential of this technology is that good solutions can be spread more quickly to many hospitals and workplaces," Dana Kulic, an associate professor of computer engineering at the University of Waterloo, said in an MIT news release. "For example, innovative improvements can be distributed rapidly from research hospitals to regional health centres." Chris Newmarker is senior editor of Qmed. Follow him on Twitter at @newmarker.